No amount of hard work ever goes unnoticed and Xenocide has proven it with the release of their debut album Galactic Oppression. Since 2008, the quintet started work on the album right away, eventually releasing it in 2011. The Runner’s Sana Sohel got together with Tabreez Azad, vocalist and guitarist for the band, to get the scoop on their journey and what lies down the road ahead. Sana Sohel: What is the inspiration behind the name Xenocide? Tabreez Azad: It was inspired by Orson Scott Card’s Ender’s Game series. We felt that the name “Xenocide” was used in its weakest form with regards to the book so we took the name and made it to what we thought it best represented. Authors such as Carl Sagan, Isaac Asimov, and the Mass Effect games influence our lyrics and themes. SS: This is your debut album. How has your journey been up to this point? TA: Its been an amazing ride, filled with lessons learned and friends made. 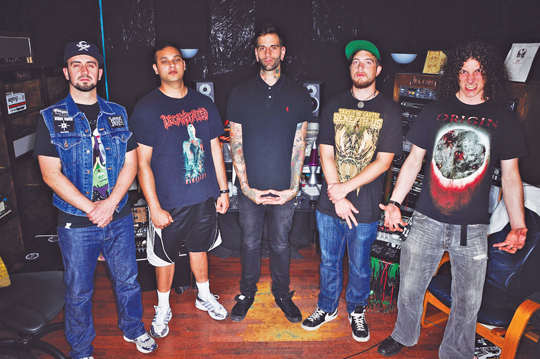 There have been four to five solid line-up changes since Xenocide’s inception in 2008. It took a while, but we found the right members who not only represent the band well but are also looking to evolve musically. The best part of the journey so far was recording the album in 2011. SS: Tell me a bit about your band, its members and the music. TA: Best way to describe Xenocide would be “death metal you can dance to”. Our goal was to make a riff-oriented death metal band with cosmological themes. Our current line-up features: Michael Jakes on vocals, Zenon Shandro on bass, Sean Leask on guitar, David McGregor on percussion, with myself on guitar and vocal duties. We’ve written well over 50 songs in our short time as a band, and we pick and choose material from our repertoire that we think best represents us. SS: Is the band doing any shows or performances at the moment? How does the future look? TA: We perform shows as they come. Touring is important for us, just as well as recording. At the moment, we have our CD release show for Galactic Oppression on March 14 at the Astoria Hotel in Vancouver. Also, we are planning a British Columbia and Alberta tour in May followed by one in Indonesia and Malaysia in October. Work has already begun on our sophomore album, tentatively titled Echoes from a Distant Star. SS: Your band’s main message and/or motto? SS: Any message for struggling artists, or dreamers? TA: Never give up. Total cliché I know but every time your neurons fire and you think, “I can’t do this,” just stop and think, “Who told you this?” You are only limited by your own inaction. Find friends that share the same interests as you, and get on it. Trust me, a recording is worth the investment.